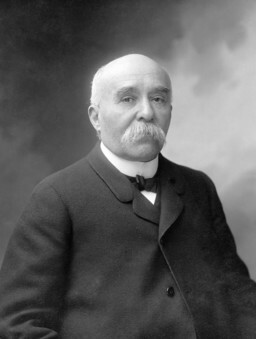 Georges Benjamin Clemenceau was a French statesman, physician, and journalist. He served as the Prime Minister of France from 1906 to 1909, and again from 1917 to 1920. For nearly the final year of World War I he led France, and was one of the major voices behind the Treaty of Versailles at the Paris Peace Conference in the aftermath of the war. He is commonly nicknamed "le Tigre" (the Tiger) and "le P�re-la-Victoire" (Father Victory) for his determination as a wartime leader.